Microsoft released its Remote Desktop Connection (Terminal Services Client 6.0) software today for Microsoft Windows XP and Microsoft Windows Server 2003. 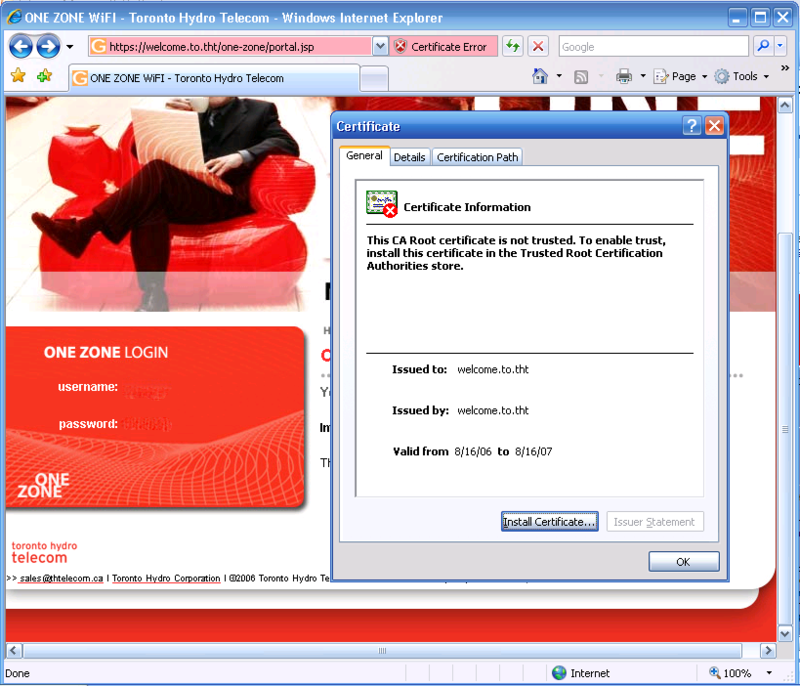 Network Level Authentication - Network Level Authentication is a new authentication method that finishes user authentication before you establish a full Remote Desktop Connection and the logon screen appears. 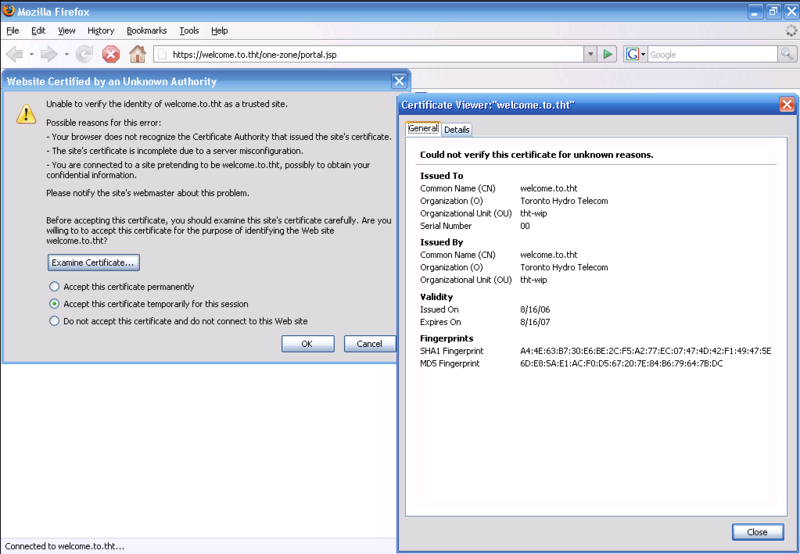 Server authentication - Server authentication verifies that you are connecting to the correct remote computer or server. This security measure helps prevent you from connecting to a different computer or server than you intend. This also prevents you from unintentionally exposing confidential information. Resource redirection - The Remote Desktop Connection 6.0 client update helps you redirect Plug and Play devices that support redirection. Terminal Services Gateway (TS Gateway) servers - A Terminal Services Gateway (TS Gateway) server is a type of gateway that enables authorized users to connect to remote computers on a corporate network. These authorized users can connect from any computer by using an Internet connection. 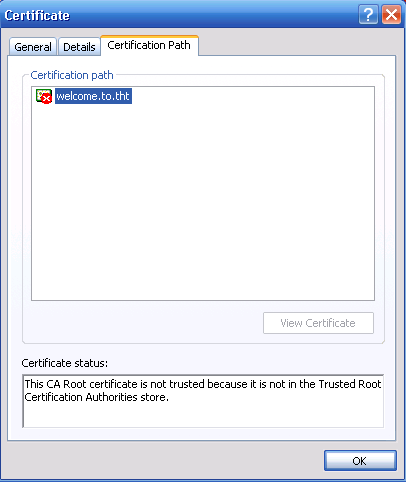 TS Gateway uses the Remote Desktop Protocol (RDP) together with the HTTPS protocol to help create a more secure, encrypted connection. TS Remote Programs - TS Remote Programs is a feature of Windows Server Terminal Services that lets client computers connect to a remote computer and use programs that are installed on it. Monitor spanning - Remote Desktop Connection supports high-resolution displays that can be spanned across multiple monitors. However, the total resolution on all monitors must be under 4,096 x 2,048. Visual improvements - Remote Desktop Connection now supports 32-bit color and font smoothing. More information can be found in this release's Knowledge Base article (KB925876). In a previous blog posting, Media Center Trick Play Functionality, I briefly talked about keyboard shortcuts that you could use in Media Center. While Media Center was optimized for a 10 foot interface, that is, it was designed to be shown on a screen 10 feet away and controlled with a remote (a la sitting on a couch), it also has a two foot interface, that is, it can be controlled via the traditional mouse/keyboard combination. Most Media Center users likely have the Media Center remote (or some similar device) but in some usage scenerios, it is not practical to reach for the remote when you are using the mouse and keyboard. For example, I might be watching Media Center in windowed mode, while sending e-mails or working on spreadsheets. Unless you have three arms (one for keyboard, one for mouse, and one for the remote), it is arguably unproductive to reach for the remote. In such a case, it is good to know that there are keyboard shortcuts for almost all of the commands found on the Media Center remote. Shortcuts that I commonly use include going to the Recorded TV menu, going to the Guide, Skip/Replay of Live/Recorded TV and Channel Up/Down. What's different between the two Operating Systems? From what I could tell, some shortcuts were removed (i.e. shortcut to Messenger functionality was removed in Vista, because that feature doesn't exist anymore) but more or less, there haven't been any substantial changes. One remote function that I have found that does not have a keyboard equivalent is the 'Return to Last Viewed Channel' function. I have been bugging this since the first Media Center beta in 2002, but no action has been taken yet. On the Remote, while watching TV, pressing either the OK or the Enter button on the remote would bring you back to the last channel that you were on previous to the present channel (for example, if I go from channel 14 to 28, pressing OK or enter would bring me back to 14) . I wonder why they left this one out.. So I lined up for a Nintendo Wii this morning. 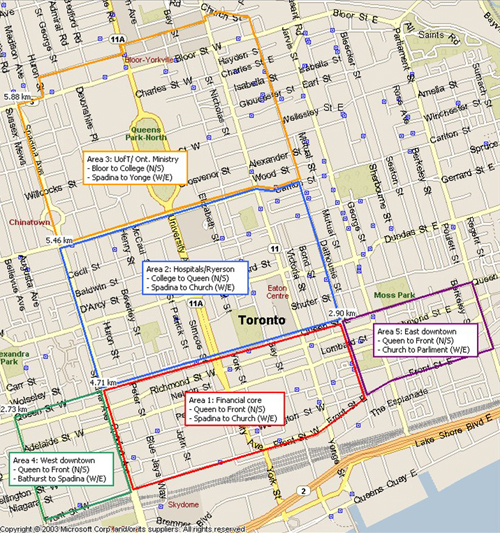 I arrived at the Best Buy on Laird Dr in Toronto at 4:45 am. Ended up being 25 out of 74 (I admit, I sort of cheated, as my brother Gary and his friend Benny 'saved' a spot in line for me since midnight). Store opened at 8:00 am, and we were back home by around 8:45 am or so. There definitely was a need to line up early, as many people who came later did not go home with a console. Even as we left, we still saw people lining up down the street at Future Shop, which was slated to open much later (10:00am). Also picked up an additional Remote for $44.95 and Nunchuk for $24.99 and a couple of games. I also had an American Express coupon which gave us $30 off on any Best Buy purchase over $300, so we even managed to save a bit of money. Perhaps the most innovative aspect of the Nintendo Wii is its unique controller. The Wii Remote is both wireless and motion-sensitive and it offers an intuitive, natural way to play games. The ergonomic controller plays into the conventional motions you might make everyday. On other consoles, if you wanted to hit a drum, swing a tennis racket or swing a bat, you would use your thumbs on a controller to perform the movement. With the Wii Remote, you can use regular motions to help make you the center of the game. For example, when you hit the ball while playing tennis or baseball, you actually simulate a swinging motion to hit the ball, or to punch someone in boxing, you perform a punching movement. The Nunchuk controller plugs into Remote and expands the amount of things you can do. Two examples given include first-person shooters and a football game. In first-person shooters, the controller carries the burden of movement, freeing you to aim and fire using a more natural motion with the Wii Remote. In a football game, you can make your quarterback elusive with the Nunchuk controller while you look for an open receiver to throw to using the Wii Remote. With the release of Windows Vista for MSDN Subscribers, I installed it on one of my computers today. This was the perfect opportunity to install my DViCO Fusion HDTV5 USB Gold to act as the ATSC HDTV Tuner in Media Center. As many of you know, ATSC HDTV in Media Center is only officially supported in the US (for both Media Center 2005 and Vista's Media Center). Because I am in Canada, this should have been a setback. But thankfully, where there is a will, there is a way. Coupled with my recent antenna install, as mentioned in the blog postings, First Foray into HDTV, HDTV Antenna Update and HDTV Antenna Update Part 2, I was ready to have Media Center tune into these HDTV broadcasts. Because ATSC HDTV is not officially supported in Canada, you'll have to resort to registry hacks. Following instuctions provided by Media Center MVP Peter Near in his blog entry "OTA HDTV in Canada on Vista betas", I was able to get Media Center to receive all the channels through my antenna. Peter mentions that he previously had trouble with CFTO and WIVB reception; however, thanks to his efforts with both those tv stations, they can now be viewed in Media Center. Here are some screenshots of Media Center in action. If you are in Canada, and you have the right hardware, you can set this up too. If you run into any issues, take a look at my previous blog entry, How to troubleshoot ATSC issues in MCE, for links to some helpful tips that will help you troubleshoot. As for me, I desperately need more than 512 megs of RAM for this computer. Windows Vista on 512 megs of RAM is like running Windows XP on 128 megs of RAM. Fixes so that 3DMark03, PCMark05, Rome: Total War, Rush For Berlin, Tomb Raider Legend and Window-Eyes Professional v5.0 work better in certain scenarios. Plugging a TV into s-video out connector, followed by entering to display manager and clicking detect displays no longer results in the TV failing to be detected. Using the Uninstall Utility to remove the display driver or Catalyst Control Center no longer results in portions of third party applications also being uninstalled. Performance Increases - A performance increase is noticed in Call of Duty 2. Performance improves as much as 12.5% at 19x12 settings and as much as 10.5% at 12x10 settings on X1900 Software Crossfire configurations. Largest gains seen with 4xAA enabled. Connecting two display devices on a system running the Windows MCE operating system and enabling extended desktop mode no longer results in display corruption being noticed when dragging and placing a window between the two display devices. As many of you Media Center users may already know, there is a finite number of tv tuners that you can have in one system. With Media Center 2002 and 2004, you were limited to one tv tuner. With Media Center 2005 with Update Rollup 2, there was support for either two ATSC tuner cards and two NTSC tuner cards or 2 PAL or 2 DVB-T tuners. These same limits remain in place for Vista's Media Center. Over the last year or so, many Media Center enthusiasts (i.e. those on thegreenbutton.com) have found registry hacks that will allow Media Center to use more than the supported number of tv tuners. However, such solutions were not for the faint of heart, as it required quite a bit of manipulation in the registry, since the functionality was not exposed in the Media Center UI. This is set to change with a new application that a friend of mine pointed me towards. 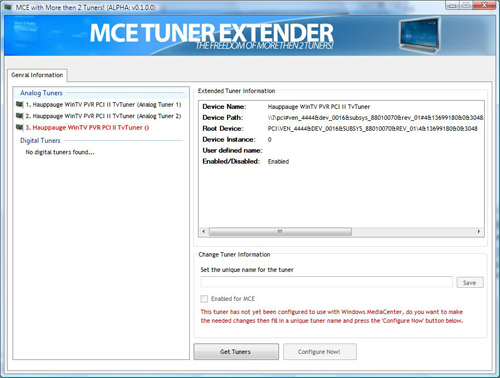 Ramon Van Bruggen has written an application called the MCE Tuner Extender. This application is aimed at presenting a user with a nice graphical interface to implement the registry hacks needed to enable support for more tv tuners in Media Center for either Media Center 2005 or Vista's Media Center. Here is a picture of the application itself. My only suggestion to Ramon would be to allow users to download this application directly without having to register. Aside from that, things are looking great. 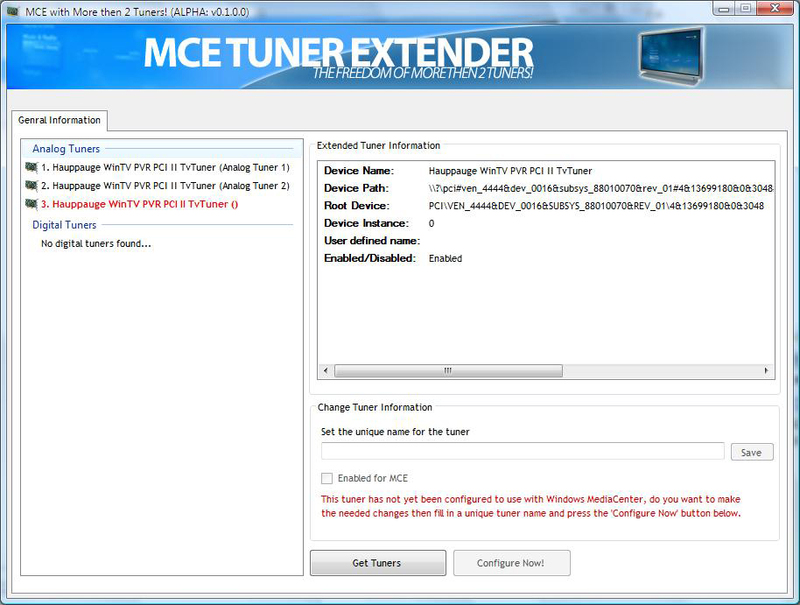 For more information about how Media Center 2005 has been designed to deal with x-number of tuners, including the registry bits required to enable more tuners than what Media Center officially supports, please see Peter Rosser's blog posting on Tuners and TuningSpaces. The DViCO Fusion HDTV5 USB Gold tv tuner that we ordered last week finally arrived. Since the weather was nice, I decided to go back up on the roof to fix up the antenna install. Here is an additional picture of the install (it is now on the proper side of the chimney relative to where it is being aimed which I've calculated to be 160 degrees east of magnetic north). What's next? I'll try to adjust the antenna some more so that I can get WGRZ. Once that is done, I'll bring the cable from the antenna into my house on a much more direct route (it is currently running around the house and through my back door). Then the signal gets split four ways. I'll need to look into possibility purchasing a pre-amp and/or a distribution amp. Once all this is done, then it is on to hooking up my Media Center computer to record this ATSC HDTV content.